View If it’s interactive, it needs a focus style on Notist. Focus styles don't have to be ugly! Focus styles are an integral part of any mature design system. 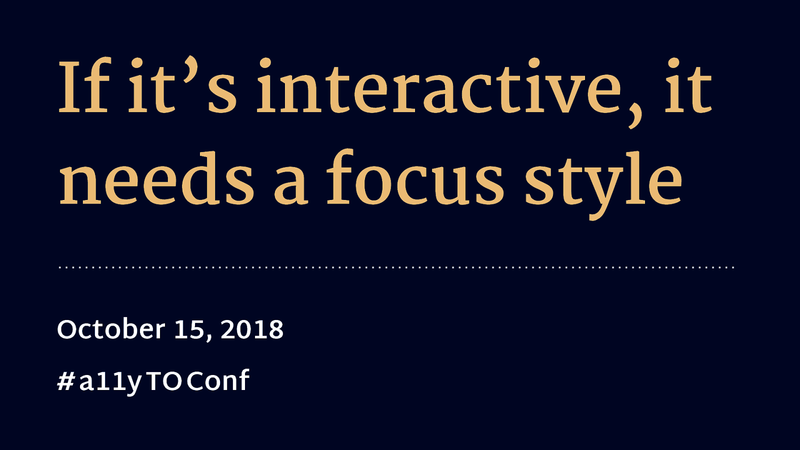 This talk will discuss the intersection of WCAG compliance and Inclusive Design, as well as new focus-related CSS selectors. Additionally, strategies for how to effectively implement them in your organization will be discussed. Online content is not print and we should stop considering it that way. Still worried about focus: visible. I get we want to change states on the fly for how people use devices, however this identities people who use adaptive tech. I am so happy to hear your thoughts on this!